Dachshund owners know that their Dachshund is always somewhere close by. Therefore, it was an odd feeling when I stood up and realized I did not have a nine-pound Dachshund sleeping up my sweatshirt. Odd. Umm, I knew he was not outside since it is too cold for him to spend any longer than necessary shivering in the garden. In a slight panic, I tried to remember the last time the front door had been opened. Is he wandering the streets of Spain, perhaps following a mule? 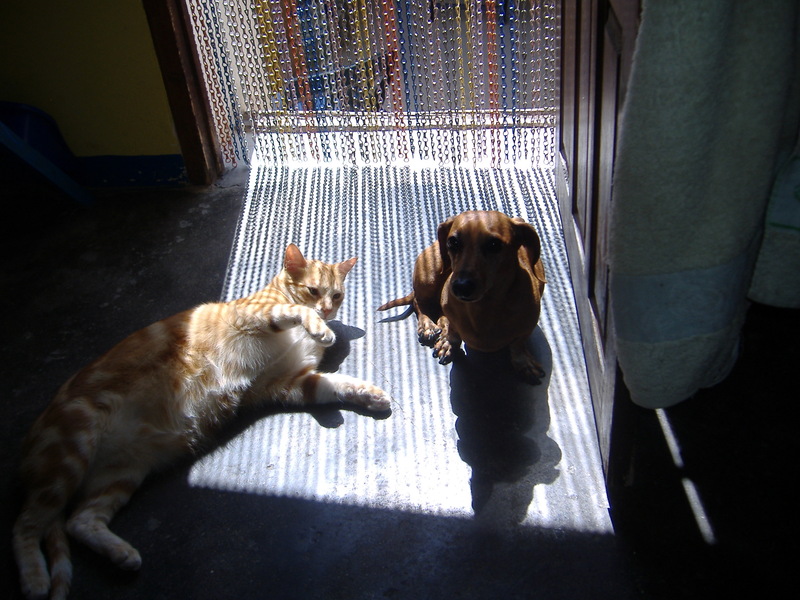 No such excitement for Dachshund Luke, you see the clouds had parted enough to let a ray of warm sun hit our open back door. There he sat with Kitty Kat soaking up what little winter warm Spain could throw their way. Dachshund Luke will do anything to find a bit of warmth – even forgo my sweatshirt to enjoy the sunshine.